U.K. Airspace - Still Open to Unidentified Attack? MoD: in 2009 they closed their defensive UFO hotline, meaning lots of potential threats to our airspace failed to ever be properly analysed and recorded. The following ‘North West UFO Research’ (a UFO monitoring focal pointy that I previously set up) data will explain that situation, for anyone who missed story in 2009. Information concerning how to report a UFO sighting to the MoD has recently been compromised with the shutdown of the MoD UFO facility. This move is the result of an internal re-organisation within the Ministry of Defence and there will be no alteration to existing MoD policy relating to UFOs explaining that the Ministry of Defence has stopped investigating reported sightings of unidentified flying objects (UFOs) in the UK. A telephone number and email address which allowed the public to report sightings for examination was closed on 1st December after the MoD decided the service was an "inappropriate use of defence resources." The closure of this facility was revealed in a Freedom of Information request released via the MoD website. The report explained that the MoD had dealt with more than 12,000 reports since it launched the reporting service in 1950; including 135 last year. The service had cost approximately £50,000 a year to operate and was based at RAF Command in High Wycombe. "The MoD has no opinion on the existence or otherwise of extra-terrestrial life." "However, in over fifty years, no UFO report has revealed any evidence of a potential threat to the United Kingdom." "The MoD has no specific capability for identifying the nature of such sightings. " "There is no defence benefit in such investigation and it would be an inappropriate use of defence resources. Furthermore, responding to reported UFO sightings diverts MoD resources from tasks that are relevant to defence. " They however added that the ongoing programme to release departmental files on UFO matters to the National Archive will carry on. Of course that will also eventually dry up because the MoD are not we presume logging any more data of this issue. I was not very surprised when I heard this astonishing news as my own experience with the MoD has been one of them showing indifference. 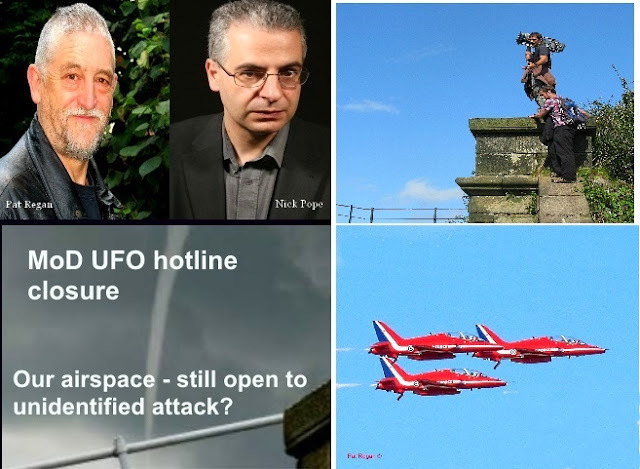 They were quite content to largely ignore my requests to investigate UFOs pictured flying close to RAF warplanes, consequently what more can I say? This agency is in existence to protect our sovereign air space and this latest revelation appears to leave the back door wide open for any form of unknown attack on the UK. The MoD’s position therefore seems to be that if an object is unidentified then they are not really interested. The MoD says: "There is no defence benefit in such investigation and it would be an inappropriate use of defence resources.” This is absolute nonsense! Can anyone believe such authoritarian apathy is these times of terrorist incursion? “From the Fifties to the present day, MoD received around 12,000 UFO reports. While most were misidentifications of ordinary objects and phenomena, around 5% remained unexplained. "Apparently the MoD’s UFO facility is being axed ”to save money. This is absurd as the staff members who have worked herein will most likely just be reassigned to other duties within the department. This closure therefore is false economy, a subterfuge to conceal authoritarian lethargy toward a vital issue and it will possibly be only a question of time until mounting public pressure demands that the MoD reopen this unique facility. We need to know what is flying though our skies – not ignoring the question." "We shall remain vigilant and keep watching the skies. I also continue to urge the media to report the many public UFO sightings that come in. Now that the MoD has 'dropped the ball' we have to rely on the press to find out what is flying through our skies. Moreover, in these times of serious terrorist inroads this is not a joking matter. " Today, we are presumably left with the same situation. Potential threats to our airspace go unrecorded and it is up to the media and the public themselves to shout out if and when they spot anything strange in our skies. This seems a very odd way to run any proper defensive system!